First things first: happy Canada Day! On a recent jaunt to visit our neighbors to the north, I was fortunate enough to visit Niagara on the Lake. While I wasn’t there long, I am completely smitten. Niagara on the Lake offers a special charm all its own; a unique blend of New England-esque appeal and a burgeoning wine industry. Think Nantucket-meets-Napa, all wrapped up with the quintessential Canadian congeniality. Located just below the Niagara Escarpment, the region is often pigeonholed as producing cloyingly sweet, flabby ice wines; an unfair assessment given the full breadth of excellent wines, and the veteran winemakers who call Niagara home. 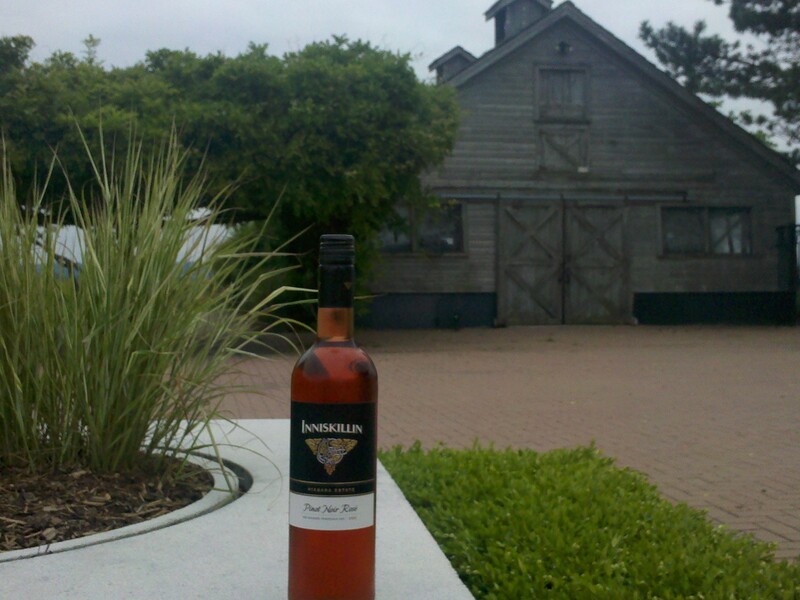 One of the founding wineries in the area, and perhaps most well-known, is Inniskillin, which planted roots in the region (literally) in 1974 and had their first harvest in 1977. Since then, the winery has grown substantially, opening a second location in Okanagan, British Columbia and winning countless awards over the years for table wines and ice wines alike. Inniskillin welcomes visitors to their flagship Niagara Estate Winery by rolling out the green carpet of rolling vineyards, a revolving menu of gourmet lunch options, and a bevy of table and ice wine tasting options. Never one to be overwhelmed by options, I bellied up to the table wine tasting bar to begin my Inniskillin Initiation. Starting with the table wines, I tried three white wines, a rose, and two red wines. The star of the show was the 2011 Reserve Series Three Vineyards Chardonnay which immediately transported me to Napa Valley. A lovely, full-bodied wine that showcases beautifully balanced oak nuances, notes of vanilla, and slight pear on the palate. I would absolutely recommend this wine to all my chardonnay fans that like a little oak and a lot of body in their glass. 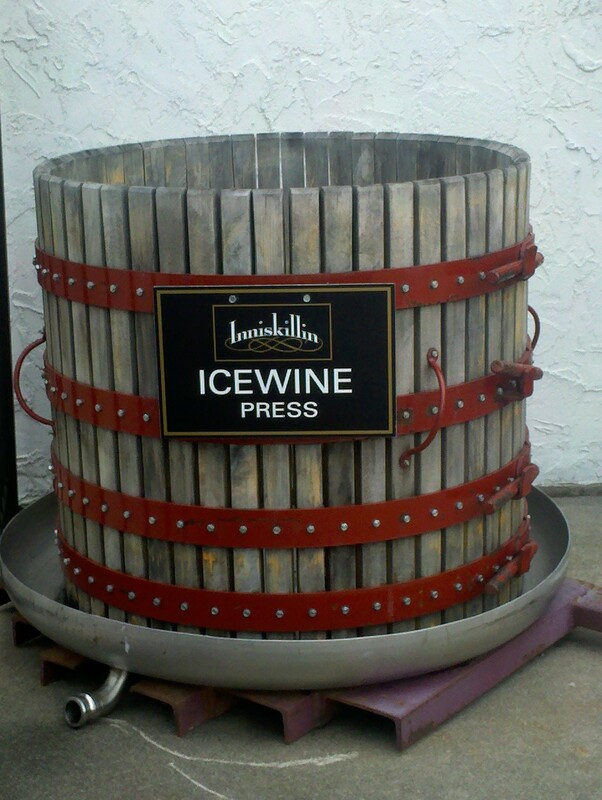 Because ice wine is serious business in this neck of the woods, Inniskillin has an entirely separate bar in the tasting room to showcase these sweet, aromatic wines. To start the program, our veteran tasting room server poured the 2011 Sparkling Vidal Ice Wine. While sweet, this wine packs a wealth of flavor and acid to structure the wine on the palate. Clean stone fruit flavors predominate, with notes of spice developing later. The effervescence is refreshing and lends this wine a special character, making this a perfect wine to celebrate a romantic occasion, or big news! From there, our adventure consisted of a series of still ice wines, made from Vidal, Riesling, and Cabernet Franc grape varieties. Our tasting consultant (Donald – highly recommend him!) demonstrated an illustrative party trick, in which the same wine is poured into two glasses – the Riedel ice wine glass, and a simple non-tapered white wine glass. Full disclosure: I did not need to be sold on the idea that glassware can significantly alter the aroma and flavor profile of a wine (by changing the way the vapors are directed and the liquid rolls over your tongue). But the differences between the two glasses were astounding. Definitely an experiment to try at home, or at your next tasting party! Perhaps the most unique and expressive wine of the entire tasting was the 2011 Oak Aged Vidal Ice Wine. I found the winemaker’s notes to be spot-on with this wine: “peaches and apricot aromas and flavors develop into complexities of marmalade […] ample natural acidity is softened by the oak aging adding a creamy vanilla flavor.” This wine showcases all the fruit a Vidal should, while introducing delicate flavors of vanilla, imbued with a delightful creaminess. Definitely my favorite wine of the entire tasting. Overall, the experience was awesome. A visit to Inniskillin certainly demonstrates why the winery has been so successful, and the incredible depth of their offerings as one of the founding wineries in the area. If you find yourself crossing the border, definitely make time for your very own Inniskillin initiation.